It was only a year ago that the Ebola epidemic in West Africa was highly visible. Images of health workers dressed in hot and heavy hazmat gear, body bags being tossed into shallow graves, and press conferences with top international health officials routinely peppered the nightly news cycle. Perhaps you, like me, promptly added a week on the Ebola crisis to your introductory course on global health, the politics of humanitarianism, African history, media studies, race and social justice, or science and technology studies. Or maybe you featured the epidemic prominently in your course on postcolonial futures or war and its afterlives. Or maybe you put together an entire syllabus on the Ebola crisis of 2014 and 2015. In spring 2015, teaching about the Ebola epidemic in West Africa as part of a general unit on postcolonial science, medicine, and technology, I found myself cobbling together a lot of different media sources in a quest to close the distance between our comfortable classroom in California and the streets of Monrovia or Freetown. I opted to stitch together the CBS news magazine 60 Minutes piece on treatment camps in Liberia, which focused almost exclusively on the plight of white emergency physicians, some short documentary footage from Sierra Leone via Okayafrica, and Donka: X-Ray of an African Hospital, a deeply affecting documentary on a day in the life of Guinea’s major public hospital in Conakry in the wake of structural adjustment. In 2015, as many of us prepare our syllabuses and return to the classroom, I highly recommend putting In the Shadow of Ebola at the top of your list for teaching about a crisis that is still quietly unfolding in West Africa, despite the forgetfulness of Western media. All of the issues that I would incorporate into a unit unpacking the Ebola epidemic are in this film — histories and legacies of civil war, the politics of infrastructure, the centrality of family, mutual aid, militarization, complications of humanitarian aid. The focus on the story of a family caught between two worlds makes it all the more powerful. In the short essays that follow, Johanna Crane, Julie Livingston, Michelle Murphy, and Peter Redfield all offer their highly perceptive reflections on the film. Crane and Livingston both provide accounts of how they used In the Shadow of Ebola as a teaching tool in the classroom. Murphy situates the film within longer histories of infrastructural atrophy and American colonialism. And Redfield meditates on the film’s visual and narrative portrayal of the epidemic itself. Filmmakers Gregg Mitman and Sarita Siegel engage with the essays and offer some broader reflections on how they came to make this film. In the Shadow of Ebola is an intimate story of a family and a nation struggling against the Ebola outbreak in Liberia. We follow a Liberian student and his family living divided between the United States and Liberia. As the crisis unfolds, loved ones are isolated in Monrovia where the government is shut down, schools and markets are closed, and food prices are rising. Liberians find themselves fighting an invisible war that is painfully reminiscent of the chaos and confusion of the fourteen-year Liberian civil war, which ended a mere decade ago. When the Liberian government responds to the crisis initially with military-enforced quarantines and curfews, mistrust and anger among Monrovia’s residents grow. As the death toll from Ebola climbs, and a quarantine results in the shooting and death of a 15-year-old boy, mistrust and disbelief are replaced by compassion and inner resolve to combat the spread of the virus. With international aid slow to arrive, Liberians turn to each other for help, as healthcare workers, musicians, and artists join forces on the front lines in public health education campaigns. The steps toward community empowerment and action help to build trust and stabilize the number of new Ebola cases. But the ripple effects — food insecurity, overwhelmed medical infrastructure, and economic isolation — endure. A slightly truncated version of In the Shadow of Ebola can be viewed for free online via PBS/Independent Lens. The full version of the film is available through Films Media Group for rental or purchase. Comments on In the Shadow of Ebola, directed by Gregg Mitman and Sarita Siegel, produced by Alchemy Films and Gregg Mitman, 2015. 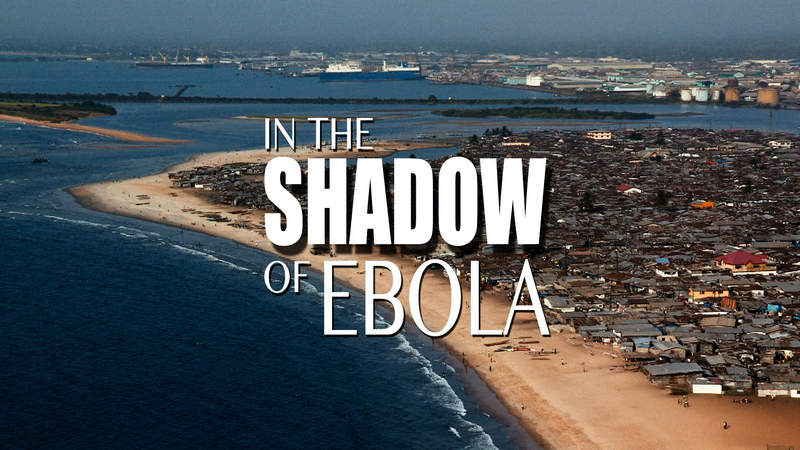 Mika M. Film Forum — In the Shadow of Ebola. Somatosphere. 2015. Available at: http://somatosphere.net/2015/film-forum-in-the-shadow-of-ebola.html/. Accessed April 26, 2019. Mika, Marissa. 2015. Film Forum — In the Shadow of Ebola. Somatosphere. http://somatosphere.net/2015/film-forum-in-the-shadow-of-ebola.html/ (accessed April 26, 2019).